Today’s Photo101 theme is Street and establishing the shot. I drove through Amarillo’s historic US Highway 66 district and just could not find a cool scene. US 66 was a major highway from Chicago, Illinois to Santa Monica, California from the 1920’s until 1985 when it was removed from the US highway system by the Interstate Highway system in its entirety. 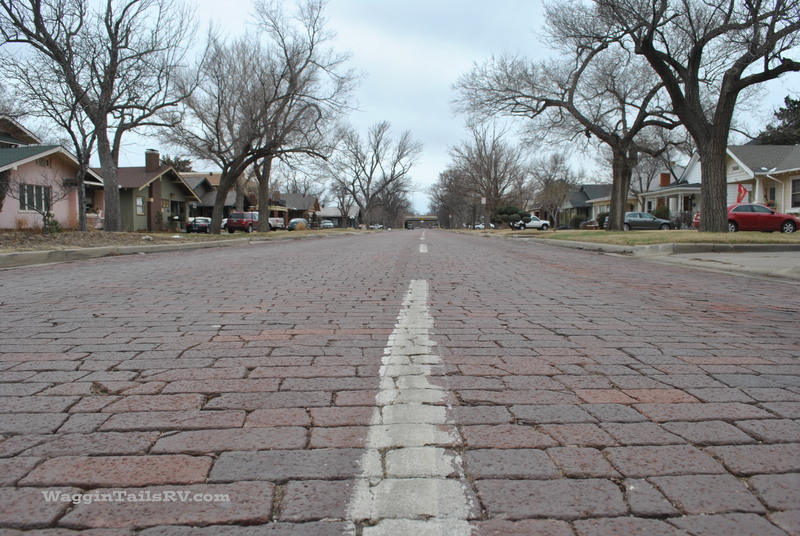 Instead of focusing on US 66, I found this cool yellow red brick road in the Plemons Eakle Historic District near downtown Amarillo. For establishing the shot, I remembered something I heard on a phoneography video. That is to think about trying a different perspective. In other words, establish the shot from a different angle. I held my camera about 3 inches off the ground for this shot. This is what a squirrel would see when scurrying across the street. Today was cloudy with a heavy overcast sky so the colors did not pop as they would on a bright sunny day. This entry was posted in Photography and tagged Photo101. Bookmark the permalink. Nicely done! You took an imaginative approach to “street” photography and it works! It has depth, layers and has a feel to it — somewhat treacherous, with a long journey ahead. The trees are subtly frightening from that perspective. Good stuff. Thank you Jim. I did have to move out of traffic after a couple of shots. Fortunately, there was a traffic control light about 2 blocks behind me. Nic pic, I think the cloudy day made for good photographic conditions. So does US Highway 66 no longer exist? I live in South Africa and this is rather iconic, so am wondering if it is no more…?